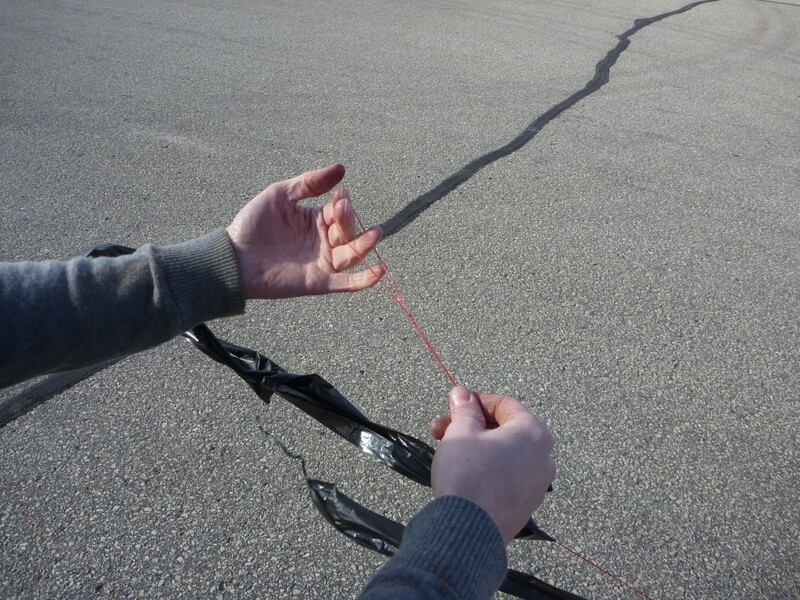 The tether is the piece of material that connects the balloon to the payload. This piece of material needs to be strong to handle the forces of wind pushing and pulling the payload from the balloon. It also needs to be light, as every gram of length needs to be added to the weight that the balloon has to lift. It also needs to be fairly long, like about 10 meters. This is because the balloon is going to move erratically, from the wind, and the string makes the payload act like a pendulum. The longer that pendulum arm, the more slowly it will swing, so even if the balloon is bouncing around as it ascends the payload will remain fairly calm, giving us better pictures and video. According to FAA rules, the tether must be able to break with 50lbs of force. We chose 50lb fishing line, but used two strands of it. 50lbs would still break it, but with a backup accidental failure of one line could still keep the balloon intact. Another feature to add to the tether is streamers. This adds to the visibility of the balloon and acts as a drag force on descent to slow it down. We used strips of a garbage bag tied at intervals, making sure to leave space at the bottom so the streamer wouldn’t cover the camera. For the end of the tether, we tied a slipknot. We then put it over the balloon before filling, but didn’t tighten it until after filling. The balloon release is the mechanism for disconnecting the balloon from the payload. FAA guidelines require that if your payload is heavier than 4 lbs, you are required to have two release mechanisms, but the popping of the balloon counts as one. Because we tried to simplify the design as much as possible, we chose not to add a release mechanism. Additionally, the balloon can act as a sort of parachute during descent, slowing it down some. Thus, tying the other end of the tether to the payload is a straightforward affair. We chose to tie it to a point near the center of the payload so that the camera would point down on ascent and take photos of the ground while rising, but then when the balloon popped the fins would help orient it vertically to take photos of the horizon.